Leo J. Beachy: A Southwest View of the Cove, Md. 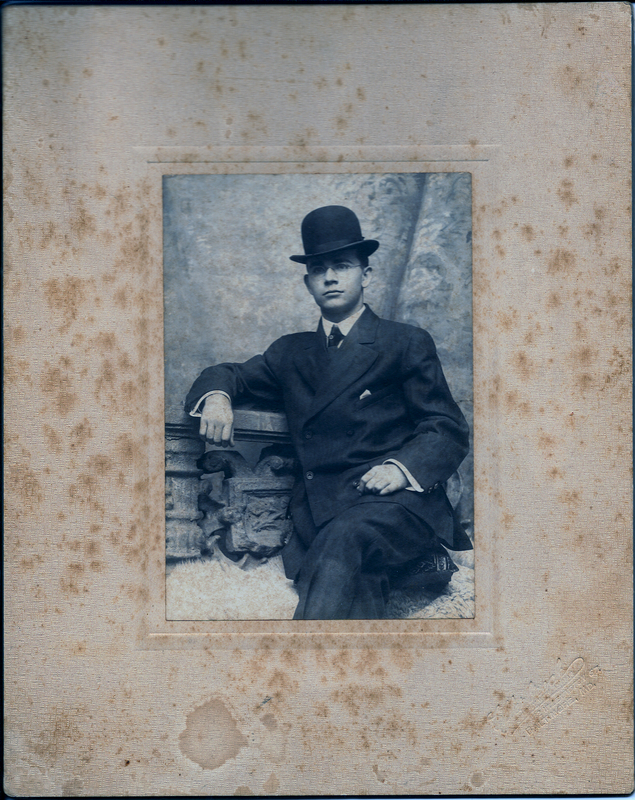 This confident young man, identified on the reverse of this photograph as Dr. Ernest Funderburk, DDS, sat for his portrait at the Baltimore studio of Herman Ellerbrock (b. abt. 1869, Maryland). Ellerbrock, son of German-born baker August Ellerbrock, appears listed as a photographer in Baltimore business directories of circa 1890, with the address 215 N. Patterson Park Avenue. A 1904 Baltimore SUN advertisement gives his business address as 109 West Lexington Street, the nearly unreadable address at bottom right. Difficult to make out below the name “Ellerbrock” in the lower right-hand corner are the words “formerly with Ashman.” This tells me Ellerbrock established his bona fides as an independent “operator” by referencing his association with his former employer, the well-known Baltimore studio photographer William Ashman. Ellerbrock’s young subject may have been James Ernest Funderburk (1885-1972), who graduated from the University of Maryland Dental Department in 1908 (today’s UMD School of Dentistry). Born in Cheraw, Chesterfield County, South Carolina to farmer James Thomas Funderburk (1847-1934) and Mary Welsh or Welch (1852-1907), J. Ernest Funderburk, as he is sometimes identified, did post-graduate work in oral surgery and anesthesiology before beginning private practice. He returned home to Chesterfield County, South Carolina to practice dental surgery, and married Mary Eliza Sellers. After her death, he married Effie Wall, and between his two wives, he had ten children, eight of whom survived to adulthood. An elder and deacon of the First Presbyterian Church of Cheraw, South Carolina, he is buried in Old St. Davids Episcopal Church Cemetery, Cheraw. His youngest son, Ervin W. Funderburk, followed him into the dental profession and may still be practicing in Cheraw. According to the research of an anonymous family historian and of Shirley Burks Wells, Dr. Funderburk’s grandfather, also named James, was born in South Carolina in 1809, and the family’s roots in Chesterfield County and Lancaster County, South Carolina, trace back to the pre-Revolutionary era. A large memorial erected in the cemetery of Spring Hill Baptist Church in Lancaster County traces the family’s roots back to German settler Hans Devauld Funderburk (1724-1818). Two aspects of this portrait mark it as transitional. While Dr. Funderburk leans against a bit of papier mache balustrade, a typical 1880s studio prop, the card mount is oversized and has a fine texture meant to mimic linen. Ellerbrock chose an understated blind embossed advertising mark, all more typical of early 1900s studio practice.